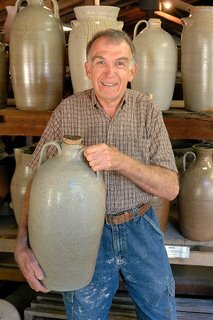 Luck's Ware continues the ancient art of wheel-thrown pottery near Seagrove, the "Pottery Capitol" of North Carolina. Visitors can experience the entire process from the mixing of the clay to the finished ware. Sid Luck, a fifth generation potter, and sons, Jason and Matt, continue the Luck pottery tradition. This pottery tradition is observed in the shape of many old time functional stoneware pieces such as candle holders, churns, jugs, pitchers, and teapots. Sid digs local clay to use in some of his pottery. One of the wheels he still uses for turning was originally in his father's shop. A wood-fired groundhog kiln is used to produce salt-glazed pottery similar to that produced many years ago by Luck ancestors. Luck's Ware is open six days-a-week Monday through Saturday - 9 a.m. until 5 p.m. - and most holidays. Purchases cannot be made via the Internet.